Today I had a beautiful day with my family at Gurdwara. It is always nice having that appointment to meet with the Guru and experiencing being with the Sadh Sangat. My wife Arjan brought Charanjeet Kaur to our Gurdwara for the first time, and many of the Sangat got to meet her for the first time. We were there from the very beggining of Gurdwara and almost the last people to leave (Arjan was chatting with lots of people). Generally for the first 40 days or so we take as a private time at home for the parents to bond with the new born child, heal from pregnancy/labor, and allow the baby to acclimate to this new world. So, here I am now sitting and thinking about the beautiful day and processing heavy thoughts after talking to some friends in England. I have to say I am again saddened when I hear how Sikhs are fighting and putting each other down in the so called name of "Helping". It’s like people are ganging up in a "war", with the sole intention seeming like destruction. Time and time again I am seeing people with some agenda ruthlessly attacking people and organizations. Where is the heart? Where is the compassion? Where is the understanding? Where is the love that the Gurus gave to the people of their time? Most of these things seem to be more like an argument where two people are arguing and no one is listening. It’s just a lot of shouting and noise. I read some of the stuff people post on the internet about "this and that" being "Anti Gurmat". When I read the messages it comes accross like an emotional soap opera where people are not really thinking and just jumping on some thought that someone typed. There seems to be little effort in trying to be understanding and neutral. People are hacking someone down with a sword or with their finger on the trigger ready to shoot. In case you are wondering…these comments are in relation to negative publicity that some individuals and organizations are on a mission to put out in England about the Sikh Student Camp (which starts in a few weeks). Always bunching the camp with actions of some individuals, or picking at things. With this same line of thinking you could say all Sikhs are bad, because one or two that you met treated you this way. One could argue all day about this type of thing to justify their actions. The thing I have learnt is that there are always many sides of a story and I feel that in this situation the accusers have blinders on and are picking at things; failing to see the big picture. It’s as if they are on a crusade to "save the world" (in their mind). One of the pieces missing in all this negative talk is all the people that were deeply impacted by this camp in a positive way. I myself participated in the camp last year and had such an AMAZING experience (You can read some of my experiences ). I saw people change before my eyes over the few days that I was there. Yes, mistakes may occur as is only natural and we all do the best to learn from these. My point of writing this post is not to criticize people, but to bring up the need for youth leadership in the role of being the "fork lift" for people. To raise them up, inspire and help them (NOT to be the building demolisher). Many are too quick to bring out the pitch forks and swords, and condemn people for some action. I’m not saying that you shouldn’t stand up to something that you feel is wrong, but don’t do it with blinders and without heart. Think of Bhai Kanhaiya who gave water and help to the injured enemy soldiers. It’s that type of heart that I am talking about that I feel is missing sometimes. There always seems to be some hidden agenda which is the real motive for many actions. We all have a choice as to how to spend this precious energy of life. We all complain about the politics and "infighting" that goes on within the Sikh community. How will this change? Who will change this? This change starts with you, and every action and thought that you have. I consciously choose not to involve myself in the let-down/put-down, negative talk, slander, gossip, of others. You can make choices like this too. I think The Khalsa Panth will only be unified when we learn these lessons and can truly treat each other as brothers and sisters and humans of the one God. Embracing our differences yet leaving behind politics, gossip and hate. Is this too much to ask? I think not. Though this depends on you. Big change starts with each individual. Like the small drop that creates ripples in the water of a pond. Let our love for the Guru be the guiding light, and ripple accross the hearts of all those that we interact with. So, enough said for one night. Please keep comments civil if you chose to comment on this post. I’ll leave you all with this audio file from Gurdwara by my friend Nirinjan Kaur. bhai sahib you sound really down about the state of the panth in the UK, and i don't blame you, there is a gap, a big hole, but it has only been created by ourselves. There has been some issues about the sikh student camp, but this is because many people have come back from it with complaints, many females feel as though they were not treated equally, but felt rather degraded by the way they were treated by the males looked at them, the lustful comments being made, the physical contact between the males and females (not just one or two, it just seems to be the norm). This is not pointing fingers at anyone, it is hearing the voices of these victims. Im sure many people have come built love for sikhi from going to this camp, but too be honest, this is not good enough if there are others who are being put off the sikhi roop because of what they see and experience, it is not enough if it is just one girl that comes back feeling degraded. Women have self-respect, siri guru gobind singh ji gave us dignity like no other leader, and we would like to maintain it. the saddest thing is that it is not any 'moghuls' that are preventing this, but rather our own 'brothers'. You have exposed and emphasised the beauty of the sant side of sikhi, but when it comes to this, we have to look at the pro's and cons, in the long term for the panth. Singhs already have a bad name, they are known to drink, be dodgy, and now it is getting to the stage where the BEAUTIFUL bana is staining. I hope to guruji for the himmat so we can all stand above kaljug and fight it together, and not let the darkness take over. This is nobody's fault. There is no enemy, the only enemies are the vices inside us. It is easy to think certain actions are acceptable, particularly in this kaljug, but guruji left us so much inspiration to hold on to that we take advantage of. I hope I have clarified what seems to appear as an immature quarrel within the panth, it is actually very serious. The incidents have been going on for years, despite being confronted action has not been taken. In the pratham times, If a Gursikh singh heard of a female being degraded, im sure more action would have been taken by the khalsa. Forgive me if I have offended anyone in any way. Vaheguru. A few weeks ago, I was shopping in Whitechapel, in East London. The street is lined with stalls, and I noticed a couple of sikh stallholders. They caught my eye, and invited me in. I was given water (salvation on a hot summer’s day), and made to feel welcome among the piles of t-shirts, jeans and jackets in their stall. What impressed me was their sincerity, in treating me as another sikh. That, to me, is the simple hospitality and kindness that was espoused by the Gurus. My Dear Lord and Master, my Friend, speaks so sweetly. I have grown weary of testing Him, but still, He never speaks harshly to me. I seriously don’t understand why Sikhs in UK fight so much. Usually in other countries the Gurudwara Commities will be fighting with each another.. When one organisation holds a major event, the other organisation will help them out.. I think the UK Sikh should see other countries like Malaysia and Singapore in how they create harmony within the Sikh Community.. Please stop fighting with each another.. Bhai Kaniya gave water to the enemy.. Why can’t the UK sikhs support their own BROTHERS?? Let the politician do all the fighting and let the Sangat stand united in the sprit of Chardi Kala!! Just my 2ccents. Hope I did not offend anyone..
Life is a journey of the soul. It is no mistake that our Guru is all written in Raag and Naad. The Guru’s gave us Divine speech as a forklift and also as a training in how to speak. Just as we train to learn music so we must train and learn how to speak. Compassion, kindness, patience, inspiration are all the DIvine qualities of God/Guru as well as fearlessness and revengelessness. Training oneself in conscious speech requires: listening, and being aware of what chakra you are speaking from to name a few areas of focus. Controlling your tongue is a basic Nitnem. The tongue reflects the mind. If our parents have not trained us in conscious speech at least our Guru trains us. Those that understand this and can apply the “grace of Guru” to their lives and speak sweetly are very blessed indeed. Those that live in their anger and pain and fling their words about in attack need blessings and prayers. Have you ever heard the expression, “open the lips, and sink the ships”? Speaking is an interesting opportunity. isn’t it?! Harjan Kaur, I agree that woman need respect and that incidences like this are NOT ok. The focus I have seen was more on blaming the camp organizers rather then the individuals who might have been involved in a situation like this. When you have a 17+ and over camp which consists of many people from Sikh backgrounds but who don’t really know much about Sikhi and are just learning you can’t expect all of them to be respectfull and totally dharmic. This is not a camp of Amritdharis who already have a level of dicipline in their life. Having a large group of people this age will be challenging no matter what! I remember when I was that age. Many of my friends got into a lot of mischief and trouble. I think help should be given more on how to help prevent situations like these where a woman might feel uncomfortable, and come up with ideas for how to deal with a situation when it arrises. That might be something talked about in the beginning of the camp. We have to think creativily and positively in how to make things better. Complaining and shutting down the camp won’t solve anything. There will always be some people that have low morality and will do sleazy thing and we have to be prepared with how to deal with these types gracefully. Let’s not trash the people that spend a lot of time and energy to inspire others and give them an experience of Sikhi in a way that they can relate to. This is seva…and we should all be trying to help out in a positive way to make things better. If not…then we will be limiting the opportunities and discouraging Sikh Youth from creating these camps in the future. Another thought to think about…is that while some people might be trouble makers we can’t just leave them behind because of some action. I see it all the time where people who cut their hair are shunned and discarded. This happens for all types of reasons. We are only human and will make mistakes and do things. This is part of the learning process in life. Idealy we should help them see the mistakes and give support. We have to see the God in each person. Seeing beyond the faults and focusing on their innner light. How about ignoring them and their negative remarks and go on about projecting your positive energies? Why do you take it so much on yourself? The title of your post says it all, we need to be the change that we want to see in the World. Just keep projecting your positivity in the World and one day light will overcome the darkness. Manjit, you are right…however sometimes by bringing up the issue it makes people think about things. Many times we do things unconciously and don’t realize how it impacts others. I also wanted to publicly show my support for the camp and the sevadhars in a time where they are getting hurt from all sides. I wanted to give a helping hand…and show of support and encouragement to KEEP UP! the incidents mentioned are not by innocent people who come to learn about sikhi, these disgusting acts are carried out by SINGHS IN BANAI that carry the roop of guru gobind singh ji and PREACH whilst doing these things. we feel bad for those beautiful innocent souls that go to learn about truth and sikhi, and are exposed to such behaviour by people that preach. it hurts me to speak in this tone but it feels like this biadhbi has gone on long enough. Harjan Kaur, this may be the case….. My point was that if this in fact happened, then it is something related to an individual and not the camp as a whole. Energy should be diverted towards the individual at fault. secondly about this issue, i really feel that when a youth of the Khalsa Panth stands up and takes leadership of leading the younger generation or his fellow friends , he/she needs to know that his or her actions are watched very carefully by critics and by the elder generation. Whatever they do gives out the projection of what kind of leader they are. I guess Harjan meant to say Beadabi when she said â€œbiadhbiâ€ which means disrespect…. This word is normally used when a gross neglect of gurmat occurs, when certain actions are extremely disrespectful to Guru ji. 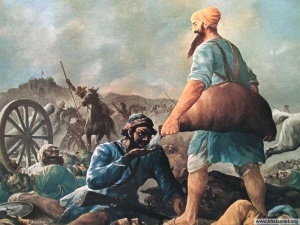 Vaheguru Ji Ka Khalsa, Vaheguru Ji Ki Fateh, Gurumustak Singh. If a few individuals have done something wrong, regardless of what they are wearing. They are the ones who should be approached in regards to these issues. Not the Camp organisers, they are already under a lot or stress in making sure the camp runs smoothly every year. I am sure if everything is resolved in a civil way, this matter will be dealt with, very quickly. But in my opinion, there seems to be another problem. Which are people are using this opportunity to pursue their own hidden agendas within the circulation of this negative PR campaign. These people who are trying to cause problems for the Camp need to practice what they preach them selves first, and learn to socially integrate with Sikhs from all walks of life. Violence and Biased Propaganda is never the best path to a solution, it will just create more animosity within the Sikh UK community. 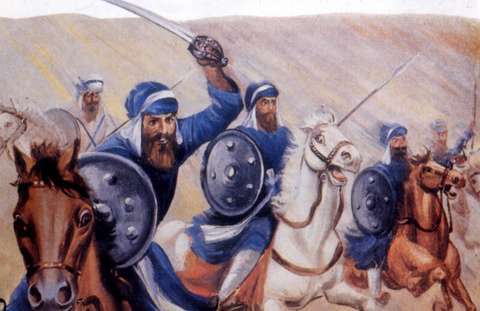 Its bad enough we get discriminated by society who know nothing about Sikhism, but to add more salt to the wounds, we have Sikhs attacking other Sikhs in the name of dharma. If this keeps going on, I wouldnâ€™t be surprised if this issue escalates to either the youth getting into more drugs or becoming more violently fanatical. How about starting a Sikh Camp Leaders And Troublemakers Blog, posting every registered participant’s name and picture? Also starting a score card of people that create trouble (1 being the best behaviour) during camps and have attendees do evaluations? It should not be this way, but it is just a thought to encourage positive behaviour and discourage trouble makers. Well i think change needs to happen… we need to expand outside the so-called “punjabi-craddle” and get out into the world! It’s time to move on, we let teh past 100 years slip past us, with no reall progress made to expand beyond our own “borders” It wil be nice to one day have all the languages, people, and cultrues represented and praising waheguru! First of all your comment is off the topic. Secondly, I appreciate your concern of spreading Sikhism but Sikhism is a religion that never forced itself on others, nor there has been a sales pitch for it to blow its own horn. Yet it has an open door policy to welcome people from any part of the world who may have any faith they believe in. It shows respect for other beliefs and believe in co-existance with them. There have been times when attempts were made to wipe it out from the face of the earth (in history and in recent past), but every attempt made it grew stronger and more believers in it. It has no borders in which it has been contained. Those who got touched by it (through out the world), embraced it on their own. Dhan Dhan Guru Granth Sahib jee Maharaaj is the Captain of the Ship Named Sikhism…. That is the best way to put it in a scentence. All change is only for a limited time. The only anchor throughout it all is GOD. GOD is the neverchanging, universal entity that is always there throughout any age. GOD is timeless/formless/always the same. The world we are living in, these are the same people that nailed Jesus to a cross, they mocked Noah when he was advised to build a boat by GOD, they bricked alive the small sahibzaade of Guru Gobind Singh Jee Maharaj. Would these people hesitate to do the same in this day and age? Generally speaking, what we are living in today is the age of capitalism. Money is the master/goal/objective. If the goal was to spread spirituality and to make a ‘GOD-based’ society where the focus was to live within the divine command of the true lord, would there be any warfare, would there be any hostility towards one another? It is true that before we can attempt to change another, we must begin by looking within ourselves. Guru Granth Sahib is a living embodiment of all virtues that are out there. i totally agree, a way of life should never be forced on another person. This is not really off topic, since reaching out into the world will change the complextion of the sikhi sommunity. About over 90% of sikhs are still in one particular culture/background. This is a far cry from other religions. while we are not in a contest, and it should not be our priority to get higher numbers – the sikhi community will benifit greatly by opening the door to more poeple. The way to show the path of waheguru is to “lead by example” and seva – not converting and forcinf others to join. Lionchild, you said, ” the sikhi community will benifit greatly by opening the door to more poeple”. The doors are already open. In my prevoius comment I already said that Sikism has an open door policy to welcome people from any part of the world who may have any faith they believe in. Anyways, It is not a number game… Sikhism is not about quantity, It is about quality…. I an I am not an official Sikh but I an I is a Student of Jah so in reality me is a Sikh. Was reading some of the comments about eating meat and how people who eat should not be judged. This is so true but the facts of Life and of the Heavens are fundamentally there for all to see. You can manipulate the scriptures and doctrines to please your own appetite but it is plain and simple for all to adhere to if you wish to accept the Real Truth. We are all made up of the Tattvas and Gunas in different proportions but it is down to each and everyone of us to learn our own constitution and change it to become sattvic. Meat is tamasic and keeps you earthbound. It makes you animalistic and fiery and is far from the Greatness of the sattvic purity of the Highest Heavens. To be at one with the Most High we must allow ourselves to be taken there by the Guru but this can only occur if we present ourselves in this human form as the Heavens wish it to be. This form is sattvic, which means eating only foods that have purity and freshness and are dare me say it, vegetarian. These foods are here to help us attain the Glory of the Guru not to hold us back. Obviously some tamasic and rajasic foods are to be eaten to balance the body throughout our life times but eat someting that is going to pass through you and be absorbed not turned into a toxic substance called ‘urea’ which is then urinated out. The human body can only digest a certain amount of protein in one sitting so eating large steaks and pieces of meat is a total waste of your subtle energies, puts stress upon your liver and kidneys and clogs up your colon with putrefied undigested corpses. Basically if you eat meat your stomach and colon becomes a graveyard. Picture that before putting that which was once a living creature to your mouth. The topic is endless and I and I have not even discussed the compassion you develop for all living creatures once becoming vegetarian. How can our Kundalini energy rise to our crowns where it can shower thee with the Divine Essence when you keep yourself locked down in the lower chakras with the eating of any form of meat. Let us give ourselves the chance to attain the Ultimate and not just be a visible Representative of the Guru. Represent the Guru inside and out. The inside Atma is far more important than all forms of Religious Doctrine. Blessed be to all who eat meat and who dont for we are all Jahs children. Well yes and know, we have acceptance of them, yet very little resources for them, Even for english speaking people my self can’t get english guru granth sahib ji. and waht about the other languages of the world. Once we start to reach out more into the world, we will have to adapt and make resources available to people. Quality of quantity, however, we have alot of quantity now, with little quality. Converts often do show alot of spirit when they come into sikhi! I agree with Rasmac on the benefits of being vegetarian. Also, how can we believe in one hand that we are all creations of God and on the other hand be cruel to them including ourselves, forest, and animals. Also, as Sikhs we always talk about Khalsa- mean pure. I take that literally meaning purity of body, mind and soul. Purity of body is thru vegetarianism. Yes, people would argue what happens if you are stuck on an island or ice cap. My answer would be, “Waheguru would take care of me and provide for since He is already doing that wherever I live”. If I am meant to survive I would no matter if I am vegetarian or not. There is no guarantee that a meat eater would survive any better in an ice cap or island. I think people that put that question to me have more faith of their life in the hands of God’s creation than God. That is one reason, Sikhs don’t beg either since the Ultimate provider is God and not some human entity. when you say the sikhi community will benifit greatly by opening the door to more poeple, can you specify what will the benefit of Sikh Community be. Rather it will not be wrong to say that people who become Sikhs, will greatly bnenefit from Sikhi…. When you say “Quality of quantity, however, we have alot of quantity now, with little quality”. I guess in a short period you have been a Sikh, you could pick on people who have been practising Sikhi since they were born that they are not good… Great.. I guess your version of Sikhism has taught you well…. PS. Sri Guru Granth Sahib, English Translation Online. Can someone point me to an english translation of the song “aad gureh nameh”…its so beautiful! Do you know of something similar to the Sikh Youth Camp in the US?